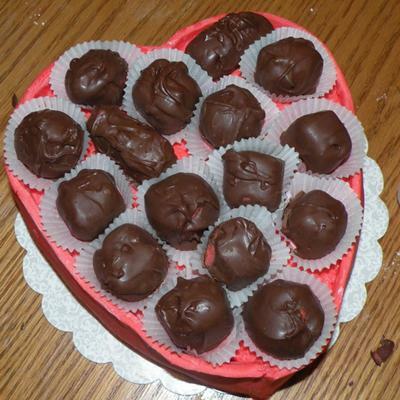 I made a full cake mix using a heart pan to make the base of my box of chocolates, leveling off the top. I used homemade fondant (marshmallows and powdered sugar) to cut out a red heart shape and two strips slightly higher than the cake. I used frosting to glue the fondant heart onto the cake board, then the cake onto the the fondant. I also used frosting to "glue" the red fondant strips to each side of the cake. I frosted the top of the cake with red frosting. For the chocolates, I mixed cream cheese with leftover cake crumbs (from the top of the cake) and dipped them in melted chocolate chips. Once they cooled, I placed them in mini muffin paper cups and filled the top of the cake with them. Delicious! They were the best part of the cake! Jessica, you're a master! It's really a work of an artist. Your Mom is so lucky to have such a creative daughter. You may open even a small business.